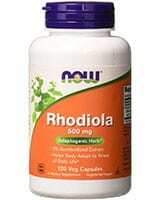 Rhodiola is most commonly used for increasing energy, endurance, strength, and mental capacity. Rhodiola rosea is a high-altitude plant with a wide range of medicinal benefits. It’s best known for its ability to improve the stress response in humans — offering powerful and widespread benefits to many different systems in the body. The benefits of rhodiola are hard to dispute — the active ingredients responsible for these effects, however, are hotly debated. 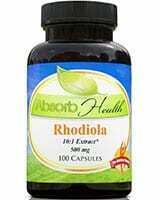 >> Looking to Buy Rhodiola? Click here to see our recommended sellers. When buying rhodiola supplements, you can find versions standardised to contain either rosavins or salidrosides — the two main classes of active ingredients in the plant. This difference is especially apparent between the two main species of the plant. 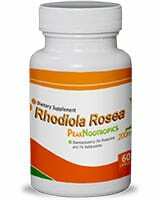 Rhodiola rosea tends to have higher rosavin, while Rhodiola crenulata has higher salidroside. Although both compounds offer their own set of benefits — it makes shopping for rhodiola confusing. Which one is better? Here, we’ll cover the difference between these two active ingredients in rhodiola, differences between rhodiola species, and when to use each of them for maximum benefit. Rhodiola is an adaptogen — it increases our ability to resist stress. The stress response is regulated by an intimate connection between the brain (hypothalamus and pituitary) and the adrenal glands. Higher regions in the brain perceive stressful activities and transmit the signal to the hypothalamus which is responsible for regulating the stress response. The hypothalamus delegates the pituitary and adrenals to turn up the stress response — also referred to as the fight or flight response. A healthy stress response is triggered only when real stresses are present (such as in life-threatening situations). As soon as the trigger is gone, the stress response stops and the body returns to normal. In people with dysfunctional stress-response systems, this system is activated inappropriately in the face of non-life-threatening stress. It may also remain active long after the source of the stress is gone. Too much stress response can result in serious long-term health consequences. What makes rhodiola so special is its ability to buffer this system — raising the threshold for stress to trigger, and helping the stress response turn off again when it’s no longer necessary. This has many benefits long-term, primarily in treating conditions such as depression and chronic fatigue. It’s also an excellent nutritional supplement for athletes, providing an added boost in performance. Improves short-term memoryPetkov, V. D., Yonkov, D., Mosharoff, A., Kambourova, T., Alova, L., Petkov, V. V., & Todorov, I. (1986). Effects of alcohol aqueous extract from Rhodiola rosea L. roots on learning and memory. Acta physiologica et pharmacologica Bulgarica, 12(1), 3-16. Improves attention capacityDarbinyan, V., Kteyan, A., Panossian, A., Gabrielian, E., Wikman, G., & Wagner, H. (2000). Rhodiola rosea in stress induced fatigue—a double blind cross-over study of a standardized extract SHR-5 with a repeated low-dose regimen on the mental performance of healthy physicians during night duty. Phytomedicine, 7(5), 365-371. Darbinyan, V., Kteyan, A., Panossian, A., Gabrielian, E., Wikman, G., & Wagner, H. (2000). Rhodiola rosea in stress induced fatigue—a double blind cross-over study of a standardized extract SHR-5 with a repeated low-dose regimen on the mental performance of healthy physicians during night duty. Phytomedicine, 7(5), 365-371. Reduces symptoms of anxietyZapesochnaya, G. G., Kurkin, V. A., Boiko, V. P., & Kolkhir, V. K. (1995). Phenylpropanoids as promising biologically active substances from medicinal plants. Pharmaceutical Chemistry Journal, 29(4), 277-280. 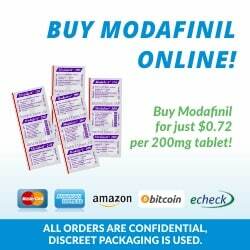 Improves cognitive performance under stressful conditionsSpasov, A. A., Wikman, G. K., Mandrikov, V. B., Mironova, I. A., & Neumoin, V. V. (2000). A double-blind, placebo-controlled pilot study of the stimulating and adaptogenic effect of Rhodiola rosea SHR-5 extract on the fatigue of students caused by stress during an examination period with a repeated low-dose regimen. Phytomedicine, 7(2), 85-89. Reduces negative side-effects of altitude sicknessLee, S. Y., Shi, L. S., Chu, H., Li, M. H., Ho, C. W., Lai, F. Y., … & Chang, T. C. (2013). Rhodiola crenulata and its bioactive components, salidroside and tyrosol, reverse the hypoxia-induced reduction of plasma-membrane-associated Na, K-ATPase expression via inhibition of ROS-AMPK-PKCξ pathway. Evidence-Based Complementary and Alternative Medicine, 2013. Supports depressive symptomsPanossian, A., Nikoyan, N., Ohanyan, N., Hovhannisyan, A., Abrahamyan, H., Gabrielyan, E., & Wikman, G. (2008). Comparative study of Rhodiola preparations on behavioral despair of rats. Phytomedicine, 15(1-2), 84-91. 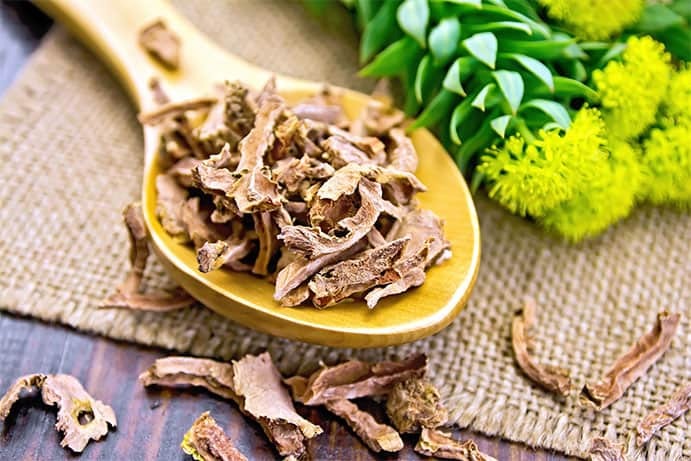 Most rhodiola extracts in scientific research use standardised extracts — the extract is guaranteed to contain a certain amount of either rosavin, salidroside, or both. Standardising certain key compounds in plants is often used in an attempt to quantify its effects. The theory is that if the main constituents are always in the same concentration in the plant, the effects will be more reliable. This way if a study finds benefits (or negative effects), the researchers can confidently state that other extracts with the same standardisation will produce the same results. This, of course, is very difficult to do when you consider the fact that the plant has well over 100 different compounds, with close to a dozen of them considered active. Additionally, there are so many variables contributing to how much of these compounds are in each plant. Everything from light exposure, temperature, altitudes the plant was grown, and how long it was stored will affect the constituents. Generally, rhodiola extracts are standardised to 3% rosavins and 0.8–1.0% salidrosides by weight.Perfumi, M., & Mattioli, L. (2007). Adaptogenic and central nervous system effects of single doses of 3% rosavin and 1% salidroside Rhodiola rosea L. extract in mice. Phytotherapy Research, 21(1), 37-43. Rhodiola rosea extracts generally come in standardised concentrations of 3% rosavin, while Rhodiola crenulata is made with salidrosides standardised instead. Which one should we be standardising rhodiola to? And should we even bother standardising herbs like rhodiola? In order to answer this question, we need to look at rosavin and salidroside in more detail. Rosavins are a group of closely-related compounds including rosarin, rosavin, and rosin. Chemically, this group is considered cinnamyl alcohol glycosides (phenylpropanoids). Rhodiola rosea,on average, contains higher levels of rosavins than the other active compounds such as salidrosides. Many companies are manufacturing their rhodiola to contain around 3% rosavin content. Some studies have suggested that rosavin is only effective when other compounds, including salidrosides, are also present. Panossian, A., Nikoyan, N., Ohanyan, N., Hovhannisyan, A., Abrahamyan, H., Gabrielyan, E., & Wikman, G. (2008). Comparative study of Rhodiola preparations on behavioral despair of rats. Phytomedicine, 15(1-2), 84-91. We recommend finding a product that advertises standardisation of both rosavin and salidroside. Bioactive compounds of Rhodiola rosea (left to right) Rosavin, Rosarin, and Rosin. 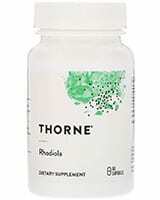 The other main biomarker for rhodiola is salidroside — also referred to as rhodiolaside. It’s often used to quantify the quality of the rhodiola extract,especially the species Rhodiola crenulata, which doesn’t contain the rosavins. When salidroside content is low, we generally consider it to have low therapeutic benefits. Salidroside is a glycoside form of tyrosol (a phenylethanoid). It’s found in high amounts in Rhodiola crenulata as well as a few other unrelated plants. Several studies suggest the salidroside content in rhodiola as being the most important compound class in the plant. Darbinyan, V., Kteyan, A., Panossian, A., Gabrielian, E., Wikman, G., & Wagner, H. (2000). Rhodiola rosea in stress induced fatigue—a double blind cross-over study of a standardized extract SHR-5 with a repeated low-dose regimen on the mental performance of healthy physicians during night duty. Phytomedicine, 7(5), 365-371. They’ve have been shown to possess MAO inhibitory benefits (antidepressant),Van Diermen, D., Marston, A., Bravo, J., Reist, M., Carrupt, P. A., & Hostettmann, K. (2009). Monoamine oxidase inhibition by Rhodiola rosea L. roots. Journal of ethnopharmacology, 122(2), 397-401. provided a dose-dependent improvement on fatigue symptoms in mice,Li, M., Donglian, C., Huaixing, L., Bende, T., Lihua, S., & Ying, W. (2008). Anti-fatigue effects of salidroside in mice⋆. Journal of medical colleges of PLA, 23(2), 88-93. and protect the neurons from the negative effects of beta-amyloid plaquing responsible for the progression of Alzheimer’s disease.Zhang, B., Wang, Y., Li, H., Xiong, R., Zhao, Z., Chu, X., … & Chen, S. (2016). Neuroprotective effects of salidroside through PI3K/Akt pathway activation in Alzheimer’s disease models. Drug design, development and therapy, 10, 1335. Salidroside is the active component responsible for rhodiola’s anti-altitude sickness effects, especially in combination with the antioxidant and closely related compound, tyrosol. Lee, S. Y., Shi, L. S., Chu, H., Li, M. H., Ho, C. W., Lai, F. Y., … & Chang, T. C. (2013). Rhodiola crenulata and its bioactive components, salidroside and tyrosol, reverse the hypoxia-induced reduction of plasma-membrane-associated Na, K-ATPase expression via inhibition of ROS-AMPK-PKCξ pathway. Evidence-Based Complementary and Alternative Medicine, 2013. It works by protecting the cells from oxidative damage induced by low-oxygen environments (such as high altitude) and improving normal oxygen capacity by the cells to lower their demand for oxygen. Rosavin and Salidroside Chemical Structure. Rhodiola extracts containing only salidroside or only rosavin didn’t perform as well as extracts with the whole plant. Van Diermen, D., Marston, A., Bravo, J., Reist, M., Carrupt, P. A., & Hostettmann, K. (2009). Monoamine oxidase inhibition by Rhodiola rosea L. roots. Journal of ethnopharmacology, 122(2), 397-401. Both compounds are considered antidepressants but fail to produce the same level of effects in isolation from each other. One study looking at the effects of a whole-plant extract of rhodiola had antidepressant, anxiolytic, adaptogenic, and stimulating benefits at the same time. Perfumi, M., & Mattioli, L. (2007). Adaptogenic and central nervous system effects of single doses of 3% rosavin and 1% salidroside Rhodiola rosea L. extract in mice. Phytotherapy Research, 21(1), 37-43. This compares to studies involving an extract containing only rosavin — showing very limited effects on depression. Panossian, A., Nikoyan, N., Ohanyan, N., Hovhannisyan, A., Abrahamyan, H., Gabrielyan, E., & Wikman, G. (2008). Comparative study of Rhodiola preparations on behavioral despair of rats. Phytomedicine, 15(1-2), 84-91. Salidroside is also less effective than whole-plant extracts but does maintain most of its effects on its own. Li, M., Donglian, C., Huaixing, L., Bende, T., Lihua, S., & Ying, W. (2008). Anti-fatigue effects of salidroside in mice⋆. Journal of medical colleges of PLA, 23(2), 88-93. What Rhodiola Extract Should I Use? Rhodiola is useful plant for a wide-range of symptoms, but getting the maximum benefit will rely on choosing the right type of rhodiola. Now, we can use this information to guide our decision. Since we know that salidroside is better for fatigue and has better neuroprotective effects, it’s better to use extracts with a focus on salidroside for these types of symptoms. Rhodiola crenulata extracts are higher in this compound and, therefore,is more likely to be the better option. On the other hand, the beneficial effects of rosavin towards depression and the lack of rosavin in Rhodiola crenulata means that depression-related symptoms may have a better outcome with Rhodiola rosea with standardised rosavin and salidroside contents. 1. ↑ Petkov, V. D., Yonkov, D., Mosharoff, A., Kambourova, T., Alova, L., Petkov, V. V., & Todorov, I. (1986). Effects of alcohol aqueous extract from Rhodiola rosea L. roots on learning and memory. Acta physiologica et pharmacologica Bulgarica, 12(1), 3-16. 2, 3, 11. ↑ Darbinyan, V., Kteyan, A., Panossian, A., Gabrielian, E., Wikman, G., & Wagner, H. (2000). Rhodiola rosea in stress induced fatigue—a double blind cross-over study of a standardized extract SHR-5 with a repeated low-dose regimen on the mental performance of healthy physicians during night duty. Phytomedicine, 7(5), 365-371. 4. ↑ Zapesochnaya, G. G., Kurkin, V. A., Boiko, V. P., & Kolkhir, V. K. (1995). Phenylpropanoids as promising biologically active substances from medicinal plants. Pharmaceutical Chemistry Journal, 29(4), 277-280. 5. ↑ Spasov, A. A., Wikman, G. K., Mandrikov, V. B., Mironova, I. A., & Neumoin, V. V. (2000). A double-blind, placebo-controlled pilot study of the stimulating and adaptogenic effect of Rhodiola rosea SHR-5 extract on the fatigue of students caused by stress during an examination period with a repeated low-dose regimen. Phytomedicine, 7(2), 85-89. 6, 15. ↑ Lee, S. Y., Shi, L. S., Chu, H., Li, M. H., Ho, C. W., Lai, F. Y., … & Chang, T. C. (2013). Rhodiola crenulata and its bioactive components, salidroside and tyrosol, reverse the hypoxia-induced reduction of plasma-membrane-associated Na, K-ATPase expression via inhibition of ROS-AMPK-PKCξ pathway. Evidence-Based Complementary and Alternative Medicine, 2013. 7, 10, 18. ↑ Panossian, A., Nikoyan, N., Ohanyan, N., Hovhannisyan, A., Abrahamyan, H., Gabrielyan, E., & Wikman, G. (2008). Comparative study of Rhodiola preparations on behavioral despair of rats. Phytomedicine, 15(1-2), 84-91. 8, 17. ↑ Perfumi, M., & Mattioli, L. (2007). Adaptogenic and central nervous system effects of single doses of 3% rosavin and 1% salidroside Rhodiola rosea L. extract in mice. Phytotherapy Research, 21(1), 37-43. 9. ↑ Panossian, A., Wikman, G., & Sarris, J. (2010). Rosenroot (Rhodiola rosea): traditional use, chemical composition, pharmacology and clinical efficacy. Phytomedicine, 17(7), 481-493. 12, 16. ↑ Van Diermen, D., Marston, A., Bravo, J., Reist, M., Carrupt, P. A., & Hostettmann, K. (2009). Monoamine oxidase inhibition by Rhodiola rosea L. roots. Journal of ethnopharmacology, 122(2), 397-401. 13, 19. ↑ Li, M., Donglian, C., Huaixing, L., Bende, T., Lihua, S., & Ying, W. (2008). Anti-fatigue effects of salidroside in mice⋆. Journal of medical colleges of PLA, 23(2), 88-93. 14. ↑ Zhang, B., Wang, Y., Li, H., Xiong, R., Zhao, Z., Chu, X., … & Chen, S. (2016). Neuroprotective effects of salidroside through PI3K/Akt pathway activation in Alzheimer’s disease models. Drug design, development and therapy, 10, 1335.